Ever since I was a boy, I've been impressed with two kinds of machines: Ferrari's and helicopters. I guess the two don't share much apart from the price tag and being primarily a male thing. Never the less, since treating myself a ride this summer in a Robinson R-44 over a Canadian national park, I've been moving slowly but surely into the realm of remote controlled helicopters. The last model I got is somewhere in between, the Lama V4, a very popular 4-channel co-axial indoor model. At half the size of the Hughes 300, it still takes a bit of space and will break if you're too tough, but it's a great learner since the controls are so similar to a full size one. You must walk before you can run, and crawl before you can walk. It's the same with helicopter flying. With that in mind, here are a few pointers to other newbies considering going into this fun but potentially very expensive hobby. A 4-channel indoor is realistic enough to provide you with a lot of cheap flying time and practice reflexes. Do not get ambitious and go for a 6 or 7 channel chopper. Trust me, learning to control yaw, pitch and roll with the aileron stick and the trottle/rudder stick is challenging enough. Start to fly indoor. 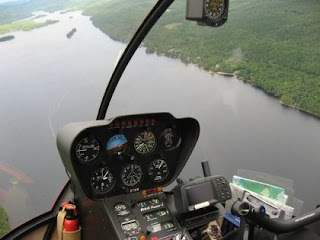 You won't have to fight any wind which can have profound implications to the flight characteristics of the helicopter, so that's one variable you should factor out when initially learning. The smaller the helicopter, the more durable it will be when crashing and the cheaper the parts usually are. If you already are going for an indoor practice helicopter, you have already excluded wind as a factor and then size matters less. The larger the helicopter, the more stable it flies. There's a balance here, i.e. while you can fly the medium sized Lama V4 outside in no wind, the same is not true for the Blade mCX as its simply too small. Consider going with a co-axial model where left and right torque cancels itself out such as to not need a tail rotor. There are a few advantages to this. The tail rotor is delicate by itself, not having it is one less thing that can break. It also makes it possible to grab the heli by the tail if something goes wrong which I've done several times. There's one drawback to it though. Turning a co-axial helicopter basically means relaxing the speed a bit on one of the axles and that means you'll loose lift and start to drop. It's not too hard to learn to compensate for this by giving it a bit more thrust as you turn, but it's a habit you don't want to carry with you over to uni-axial helicopters. Needless to say, you are also going to need a training gear. The intuitive reflex we all have when something is about to go wrong, is to cut the gas - biiiig mistake with a helicopter. Even if you've learned never to do this, maintaining perfect pitch, roll and yaw takes a long time to master and it takes only one wrong turn on the aileron stick to slam the blades into the ground. The training gear can be purchased or you can do as I, and construct it yourself using some bamboo (flexing is your friend), a glue gun and some ping-pong or Styrofoam balls. That way you can drop the heli from about a meters height and it won't suffer any damage. Consider getting some better blades when you master the basics. The plastic blades that often come with the smaller/cheaper models are inexpensive to replace, but they also flex more, require higher RPM's and is generally less stable in the air while breaking extremely easy. You can purchase carbon fiber or fiberglass blade upgrades for many small helicopters and in my experiences its well worth it for the 40-50% higher price. Get a 2.4GHz spread spectrum version rather than a fixed frequency x-tal. The problem with a x-tal system is that it's inherently susceptible to crosstalk from other devices and require a long antenna on both helicopter and radio controller. This is the reason why, if you go to an RC club, you will see people holding a dedicated frequency token such as to prevent two from using the same frequency. With 2.4GHz technology, you can pair up (bind) the receiver and the transmitter just like you may know from blue-tooth technology. It's just more future proof to get 2.4GHz stuff which is why I payed slightly extra to have this for my Lama V4. Potentially you also save money in the long run, by being able to own only one controller for your fleet of helicopters. Last but not least, you should get a simulator. I'm no big fan of simulators myself, but they can help you build up more of the required "feel" while keeping crashing a cost-free exercise. There are some fine commercial ones out there I am told, but I just practice with the free one you often get with the helicopter. Hi, I agree with all you say and after a costly start about five years ago I gave up. Now I have gone down your path and can now hover my 400 size. I have found it a very rewarding learning curve, regards Richard. You can buy one single controller, i.e. I have a DX7 and use it with all your Spectrum capable models. I have an mSR, mCX2 and Blade 400. Parts are cheap, easy to find and the helicopters is a fine arsenal for your beginner fleet. It's a lesson I wish I had known beforehand, I probably spent ~$1500 on hardware which is now broken and/or inferior to the eflite stuff. For instance, never underestimate the power of a good computer controlled RC transmitter like the DX7. The DX7 also works great with good simulation software like the Pheonix simulator. Great tips! Thanks for the post. I just picked up a Syma heli and am enjoying it thoroughly but have a lot to learn yet.